but this still overpowered those other times. his actions. He always was the responsible type. to oversee earth, he knew this transcended a typical mood swing. even in this extreme case, surprising even himself. dirt, but that wasn’t the case. delay only lengthened his journey. breadless sandwich. However, he did not care one way or another. upon himself to get in a position where he could defend himself. He looked at it as survival of the fittest. and that did not pose a problem for Carter Spence. Carter did love women, but he could not be in love with them. when it came to women. was watching a movie on television. body to the face, and saw that it was his body. give to test this theory of his. ran from the danger. Most drivers rubbernecked their way past. tornado of smoke rose through Carter. incalculable. However, good people still stopped. which were smashed all around. Carter knew his parents had expired, but what about his body? transmitted at the chaotic scene below. fire would be enough to finish the job. of that scene and into another. Take a look at this extract from middle-grade supernatural novel Matthias from Jodi Auborn. Sleeter and Quint! They were still after me, and now I was trapped! I couldn’t run into the woods without them seeing me. I waded into the thorny rose bushes beside the road, looking for a place to hide. But there was nothing but the tangled bushes, which snagged my clothes and tore at my arms. It was like trying to walk through a net. I pulled myself away from one big thorn that ripped a hole in my shirt. I finally ignored my bleeding arms and the thorn bushes, and ducked down into the muddy ditch. “We got you now, kid!” Quint and Sleeter whooped. They were still laughing at me as the car raced back up the road, louder and closer every second. I couldn’t help it. I peeked up over the edge of the road. Matthias was standing on the other side of the road, and for the first time…I could seethrough him! He didn’t look at me. He just stepped in front of the speeding car and pounded his hands down on the hood, glaring in at Quint. 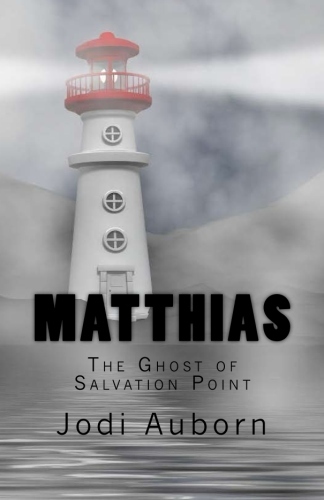 Quint stared back and screamed as the car passed through Matthias, who disappeared in a swirl of white mist. Quint slammed on the brakes and the car stopped right by my hiding place. He closed his eyes and rested his forehead on the steering wheel, making strange little moaning sounds. His whole body started shaking. “Dylan, stay down!” Matthias said as he appeared beside me and sprawled out in the mud, looking like his normal self again. He put his hand on my head and pushed me down on my stomach. My chin scraped against some gravel in the ditch. I did as he told me. The bottom of the pipe was covered with oily water and weird orange mud. I could hear Matthias pushing weeds and brush in front of the opening that I had just crawled through. I knew that he was standing guard at my end of the culvert, so I felt a little safer. It took forever for them to leave. I couldn’t move. I heard Sleeter crashing through the brush, calling me. Quint continued crying in the car. Then Sleeter yelled at him some more, and told him to move over so he could drive. I heard the car pull away, but didn’t dare to make a sound. “Are they gone?” I whispered. I looked down at my torn, muddy clothes, bloodstained hands, and scratched-up arms, and the dried brown splotches on my shirt from my bloody nose. My soaked sneakers squished with every step I took. Then I stared at Matthias as I followed him across the road and into the woods. His clothes were spotless. He didn’t even have any mud on his shiny black shoes. We didn’t say much more as we trudged through the woods. I watched as a chipmunk scampered over the leaves and squatted on its hind legs to nibble at something it held in its paws. It was cute. “Matthias, look,” I said, pointing it out. 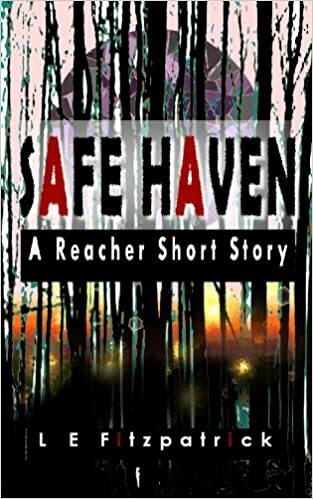 I’m very excited today to be bringing you a guest post from amazing author Alina Popescu, who isn’t just a great writer and promoter, but she’s a good friend who has held my hand for more than a year now. Check out her book, I guarantee you won’t be disappointed. They say the devil is in the details, and they probably are right, just because everything is in the details. You idiot in a text can be an insult or it can show anger. Add an emoji that’s winking or sticking its little tongue out and the meaning changes. But I digress! Authors follow the way the devil likes to play it. Sometimes, you can find them hidden in character details. Is this an extension of write what you know? Maybe. Or maybe we spend so much time with our characters that we just can’t help it and we put a bit of our very souls in them. Or some of our ideas, feelings, fears. It’s an anything goes sort of deal! I’ve been quite honest in saying that Alexa, my female lead in the Bad Blood trilogy is probably 90% me. She had my background, a lot of my physical traits, even more of how I think, react, and talk at times. She ran away to the one place I considered running away to. Yup, she’s me, no doubt about that. 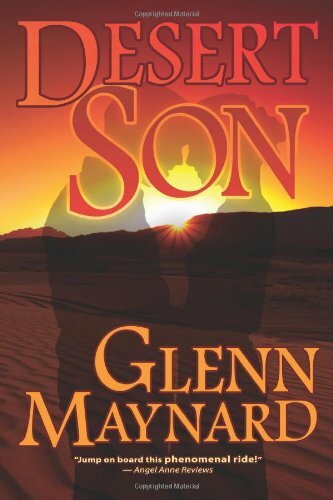 It’s the closest I’ve ever come to writing myself into a character, and that is probably why the trilogy was both therapeutic, cathartic, and challenging for me to write. However, Alexa is not the only character I added parts of me to. I added my need to get away and break free to Wynn. Sure, I did not have it as bad, but while I wrote Craving Stains, I was also staring out the window at the beautiful weather and hoping I could just forget about work and run way somewhere. Writing is always easier and better when you’re on vacation, isn’t it? Doyle did not escape either. I gave him all my love for bikes, tattoos, and adventure. In a way, Wynn and Doyle were two sides of me that were arguing with each other at the time. They went ahead and ganged up on me, making me write their story, but that’s okay! I did not stop there. Vicks, one of the main characters of my werewolf universe, got my dog, Ares. She refuses to walk him when I tell her to, even if he actually listens to her… Bad character! Shiki—who shares the same universe of the Tales of the Werewolf Tribes series and whose book, Strength to Let Go, you’ll get in early July—got my otaku side (he’s into video games, manga, and anime as much as I am), and some of my emotional hiccups, such as blaming himself for everything that goes wrong in his relationship. A young and happy-looking hostess whom Moira barely acknowledged greeted her and walked her to the Director’s office. They know how much of a screw up they have to weasel their way out of, Moira thought, a cold smile curving half of her mouth. She was going to make them sweat, and she was going to get everything she wanted from them. Doctor Miller, the chief physician on Wynn’s case, the Director, and some mousy-looking little man who Moira suspected was an accountant or something along those lines were all waiting for her. They first offered her any and all treats and beverages in the universe, and when met with her brusque refusal, they slouched in their chairs and prepared for the onslaught. “Miss Brenwood, it was simply the truth,” the accountant said in a bitter voice, but reconsidered under the murderous stare of the Director. She watched the man pale, his jaw dropping, making an obscenely gaping hole. She rolled her eyes, and then shook her head. What the hell had these idiots thought would happen? That when the Bureau came a-knocking and found nothing, they’d just go home with their tail between their legs? Of course they’d always investigate both or all parties involved in a potential fraud. “Clifton, you really have no idea how the world works. How on earth do you manage this hospital?” She graced them with her special, mocking smirk, the one she’d developed in the many decades of being a rich wife with seemingly too much time on her hands. “Mrs. Brenwood, I assure you, we will fix this,” the Director said, turning to look at the accountant sternly. office. Moira ventured a glance over her shoulder and saw the good doctor following her like the obedient little dog he was. Polite and stiff, no facial expression, no smile, no unnecessary movement, only her dark brown eyes showed some life, some slow fire that kept her going. “Hello, I am Louis and this is Alexa. We will be your hosts during your stay on earth.” Louis smiled and extended his hand, which she shook after a few awkward moments. “I look forward to it. May I be shown to my room now?” she said with no inflexion in her tone. It took me a second to react as I was analyzing her outfit…jeans and a plain t-shirt, sport shoes and denim jacket. It seemed completely wrong for her attitude and behavior. She did not sound like she meant it. She sounded more like cyborgs from a sci-fi movie. She wasn’t as captivating as Anukh or Louis, or even Anthony. She was just formal and…uptight. Oh, brother, I said to myself. This will definitely be tons of fun. When she entered the room, I finally noticed her backpack. She took some more clothes out of it, all plain and simple. She asked where she could put them and I pointed to the closet. I hadn’t realized I was. I had been warned before that my face and eyes give away what I was struggling to keep from saying but, apparently, I never learned. “Umm, dunno, you are just not what I expected,” I confessed. “And what did you expect?” She cocked her head and waited. “No, just turning it into a question till I figure out how offensive my statement is.” I shrugged. It did not sound like a compliment. “Less what?” she demanded, raising an eyebrow. “I am on a mission and I have comfortable clothes for it,” she answered, quickly. She was just staring at me and I thought I should put an end to kicking the hornet’s nest. I finally allowed myself to enjoy a refreshing sigh the moment I got on the other side of the door. I also added yet another note to self. Whenever I find myself talking to a deadly creature who can kill me in under five seconds, maybe, just maybe, watching my tongue would be smart. ***Celebrate a year of The Edge of Hope with the Amazon Countdown Deal – March 29 – April 5. Discounted price starts at 99c. A human sacrifice has forced vampires, trueborn and baseborn alike, into an escalating conflict with one side pushing for revenge, the other for freedom. 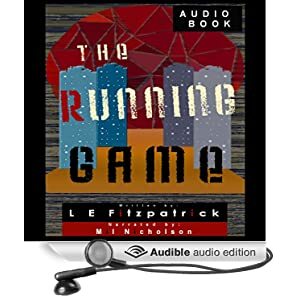 The hunt for Anthony and Louis is the trueborns’ main objective, driven by Hesrah’s desire to get even with the two baseborns and avenge her best friend, Alexa. The baseborns are rattled and divided between rallying around the rebels and obeying the rules imposed by Ankhsis. What emerges from the portal from Earth to Ankhsis in the middle of the turmoil rocking both worlds is more dead than alive. Not human and not baseborn. Certainly not trueborn. This new being will either damn them all or be their race’s most powerful weapon. Will they trust it not to destroy them, or will Ankhsis decide putting it down is the only solution? 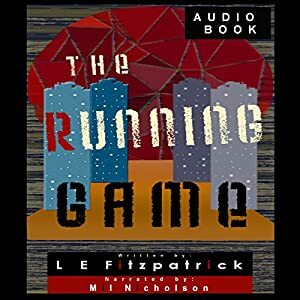 I’ve been so lucky to work with a wonderful narrator and producer Mil Nicholson, she has transformed my book The Running Game and it’s available now from Audible, Amazon and I-tunes. If you sign up to Audible you can download the book for free and get access to thousands of other books too.